After earning a week off before opening the playoff season, the UBC women’s hockey team split Friday and Saturday’s playoff series against the University of Manitoba Bisons. In a thrilling first night, the ‘Birds came out flying and scored one goal on the powerplay, and killed off all six power play opportunities -- including a four-minute double minor -- the Bisons had in a 2-1 victory. UBC’s first goal came eight minutes into the first period from Tatiana Rafter, after teammate Nicole Saxvik flew off the bench and weaved her way up and around the goal before feeding it to Stephanie Schaupmeyer and Sarah Casorso, who then sent it for Rafter to bang home. The ‘Birds kept their lead in the second period, extending it just 26 seconds in after a shot from Kelly Murray sailed past Bison goalie Rachel Dyck to make the score 2-0. Despite many opportunities afterwards, the ‘Birds were unable to capitalize while Bison captain Maggie Litchfield-Medd managed to beat Danielle Dube with only one minute of play left. Luckily, the Thunderbirds were able to hang on for the one-goal win. “It was too bad for Dubes, she had a great game and played really well,” said coach Graham Thomas on the non-shutout. “But it’s a chance to get that playoff experience and how to defend that minute-to-go kind of rush. Unfortunately, this wasn’t enough on Saturday night. The Bisons opened the scoring in the second period after a double minor from Tatiana Rafter put Manitoba on the powerplay. But UBC managed to tie it up just three minutes later. Kelly Murray was able to fire a shot from Sarah Casorso past Dyck’s shoulder to even things out. Despite many opportunities, the ‘Birds were unable to capitalize, and the score remained 1-1 after the end of the third period, which meant that the game would go into sudden-death overtime. 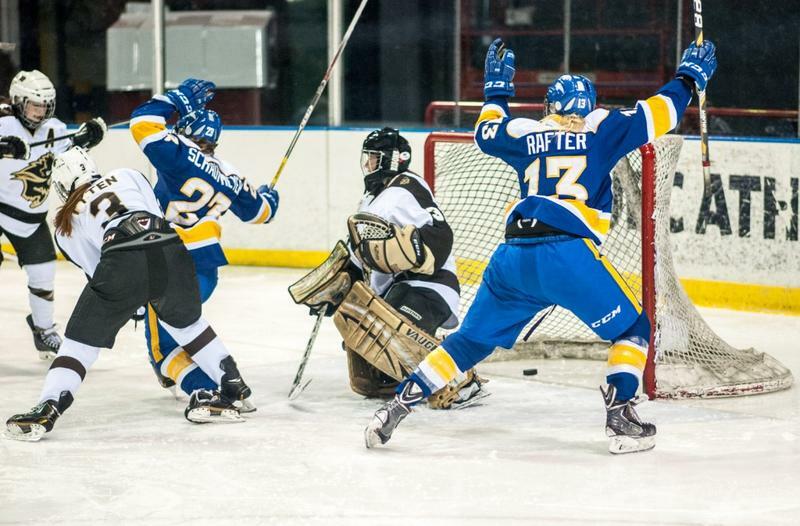 Both teams were hungry for the victory; UBC was determined to put this weekend away and move on to the finals against the University of Alberta Pandas, and the Bisons were desperate to hang on to fight another battle on Sunday. Manitoba’s Alexandra Anderson determined the winner of the game. 17 minutes into the second round of overtime, she managed to wire the puck past Samantha Langford in a dramatic finish to the match. The teams were now tied 1-1 in the series, which will be determined by Sunday’s game. Of course, the Canada West conference is extremely competitive. UBC did well in the regular season standings, placing second and earning the bye-week. However Manitoba were not far behind, and the ‘Birds knew that they would be a tough team to contend with. “It was to be expected in this kind of playoffs and to play through we’ve got to be resilient. I’m really confident that we’ll pull through,” said Thomas. The winner of Sunday’s game will move on to the finals, where they will face off against the Pandas in Edmonton next weekend. The ‘Birds are determined to reach their end goal of Nationals, and to bring home some company to their Canada West 2012-13 banner hanging in Thunderbird Arena.